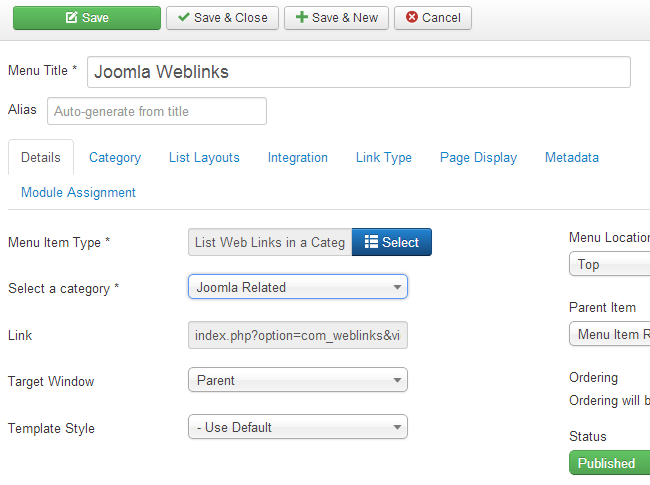 This tutorial provides additional information about managing weblinks on your Joomla website. Before we start, you will have to install weblinks as an extension. On more on how to install extensions, please visit our tutorial on the matter. Log into your website as administrator and click on the Components tab on the top menu, then on Weblinks and Categories. Click on the New button at the top-left corner. Title - Enter a title of the new weblink category. Category - This tab lets you enter a description for the new category, set it's status, access rights, language and parent (if any at all). 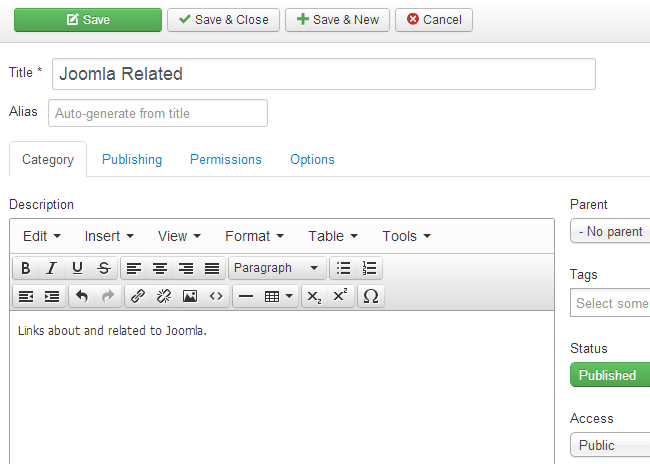 Publishing - This allows you to set a date when the category was created, meta description and keywords, author, etc. Permissions - Set different permissions for the new category. Options - Use different layout for the new category or set an image for it. Click on the Save & Close button to create the new category. 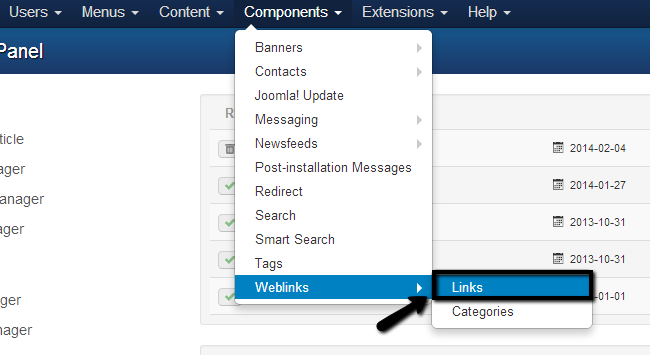 Log into your website as administrator and click on the Components tab from the top menu and then Weblinks > Links. Title - Enter a title of the new weblink. New Web Link - Enter the URL to your weblink, select status, category, etc. Images - Edit the images for your new weblink. Click on the Save & Close button to create the new contact. 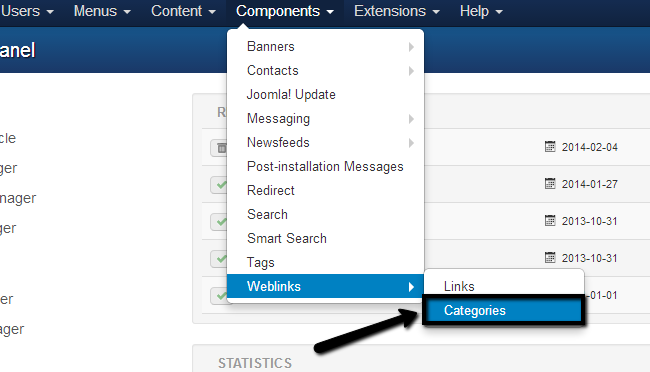 This option allows you to place a weblinks category directly on the main menu of your website. To do so, you need to log into your website as administrator. 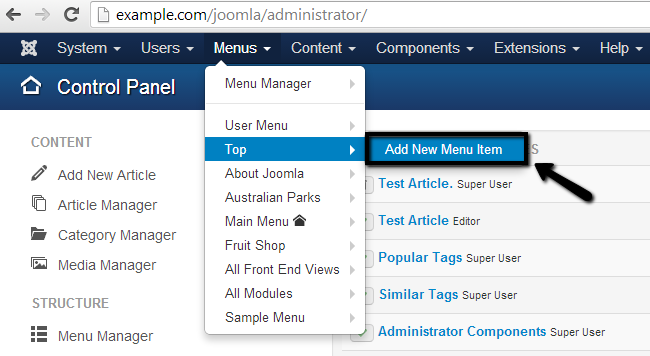 Then click on the Menus and then Top > Add New Menu Item. Menu Title - Enter the name of the menu item. Menu Item Type - Select "List Weblinks In A Category" for the type of the new item. Select Category - Select the weblinks category that you wish to include. 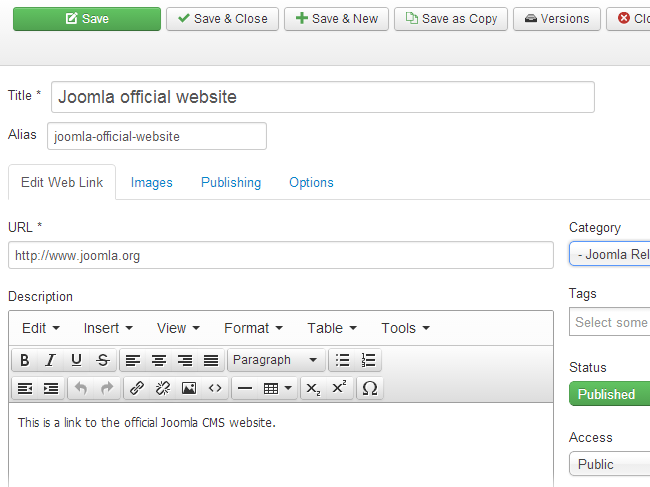 Click on the Save & Close button to create the new menu item.